It’s not always easy to raise investment capital in Canada. We are a friendly nation but we are also at times frustratingly cautious. Many Canuck entrepreneurs have been forced to forge ahead under-capitalized or venture south of the border to find funding partners. Recently however, Oakville natives Matt McCoy and Mike Sutton, fourth-year University of Guelph Business students, may have woken up to their own dream world coming true. The 21-year-olds have been friends since high school, and during that time, shared an interest in starting a business together. Three years ago, a friend’s parents hired a BBQ cleaning company, and as a result, were gravely disappointed after having experienced less than acceptable service. The BOYS saw opportunity and felt that perhaps the business concept was worth a fresh set of eyes. Matt and Mike are not afraid of hard work. However at this point they were not exactly well versed in BBQ maintenance either, but they felt it was worth testing out the sales model of this idea first. They finished their exams on the Friday and went out on the weekend and did door-to-door sales racking up four sales on their very first day. From this early success they began to believe that the sales model might just work. However, selling is one thing, fixing is quite another. Now they would actually have to learn about BBQ maintenance. They would need be the sales Force and maintenance team at the same time. And so Mike and Matt wrote a business plan, got business cards and brochures printed and began seriously pounding pavement and knocking on doors. That first summer they earned $30,000 but found it necessary to reach out to friends to help out when they got busy—good plan. The last thing they wanted to do was give poor service … it was the very reason they got into the business in the first place. Their pricing works like this: BBQ Boys will come to your house, thoroughly clean your BBQ, check for parts which need replacing for a fee of between $150 to $250. Often time, a BBQ only needs new burners, new starter or control knobs. With a BBQ Boy’s sprucing up it’s a far cry from the cost of a new BBQ. Before commencing their second summer of sales they became part of a business incubator through the John F. Woods Centre for Business and Student Enterprise. They received $8,000 to assist in getting the business further off the ground. This allowed them to expand locally and across the Greater Toronto Area, and add eight employees to the team. In its third summer Canadian BBQ Boys expanded across southern Ontario from Niagara to Ottawa. Their revenues grew too. They earned $300,000 by servicing 1,500 BBQs. They now have about 20 employees and a business concept that’s working. It was at this point that the producers of the popular CBC show Dragons’ Den got in contact with them to audition for the show. However, Mike and Matt felt they weren’t prepared yet. But by the second call they felt they were ready to make their pitch to the Dragons. They were asking $50,000 for a 10% stake in BBQ Boys moving forward. Not a lot of money considering they earned $300,000 in their third summer. While the Dragons episode was filmed last April, the details of their non-disclosure agreement forced the Boys to keep the outcome under their hats until it aired this past week. Their friends knew that something positive was afoot because of the way they acted and the way they confidently pushed ahead. It was very difficult not to spill the beans. BBQ Boys have a great website which will be developing as they go along. They plan to build their online store component to include products, accessories, How-To Videos, and additional services which will present themselves as they grow and flesh out the concept. The Dragons’ Den appearance was a tremendous experience and a huge nod of approval from the standpoint of investment. So much so, that Matt and Mike haven’t (to date) accepted the deal from the Dragons’ Den. In fact, with their TV show notoriety, other investment opportunities have been presented to them. From a health standpoint, there are many reasons why your BBQ should be cleaned and serviced. Things live in idle BBQs. Spiders, rodents and other vermin. Not something you want to mix with food preparation. Mouse droppings and burgers should never end up on the same plate. 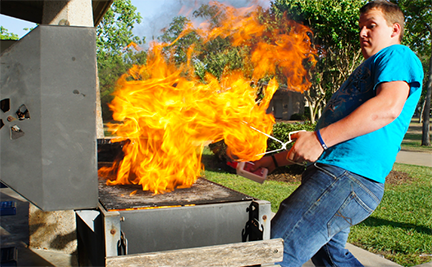 When a BBQ’s condition deteriorates, you can experience flare-ups, grease fires and minor gas or propane explosions which can be dangerous to humans. Who hasn’t at one time or another almost blown themselves up after turning on the gas and then attempting to light the BBQ with a wooden match or a hand lighter? Having your BBQ checked at the beginning of the season makes good safety sense. "Ooops! Honey...Call the fire department and grab the baking soda and some wet towels! And yer right, perhaps we should call the Canadian BBQ Boys and have them come over." BBQ prices are all over the map. From under $100 to over $5,000. Even with less expensive BBQs it’s well worth protecting, maintaining and extending the life of your investment. The more BBQs we can keep out of land fill sites or from abandonment the better it will be from an ecological and environmental standpoint. Saves you money too. Matt and Mike have just begun their journey. They’re young and they exude tremendous enthusiasm. And when school’s out at the end of next year they are going to apply what they’ve learned thus far and run with it. They have other ideas too, but for now their focus is to become Canada’s Premier BBQ Cleaning and Maintenance Service. And why not? Why shouldn’t consumers welcome Canadian BBQ Boys as they already embrace swimming pool services, yard and garden or window cleaning services? If you’re a back yard chef or are in charge of the outdoor cooking, and you love barbecuing but loathe the maintenance and cleanup, you should give BBQ Boys a call. Your family will thank you and you’ll be glad you did.